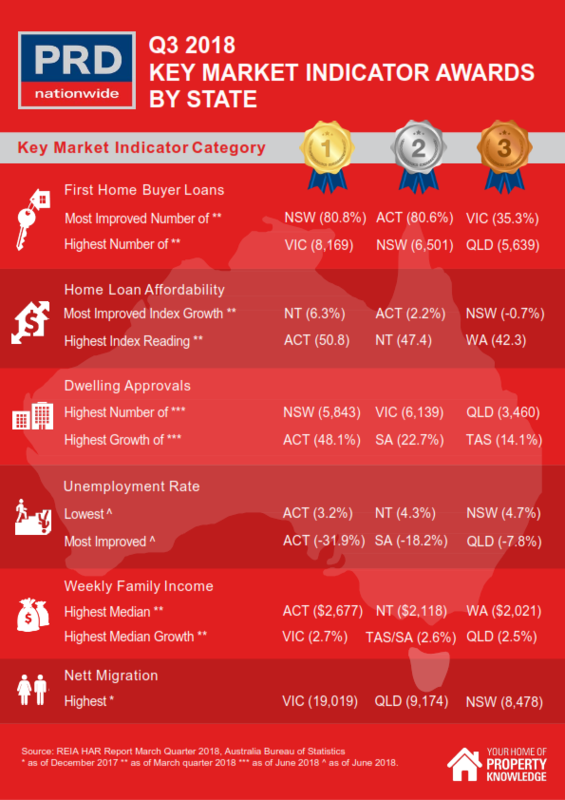 New South Wales (NSW) takes out the gold award nationally for most improved number of first home buyer loans, for the third quarter in a row. In Q3 2018 Key Market Indicator NSW recorded an 80.8% growth in the number of first home buyer loans over the past 12 months to March 2018, higher than Q2 2018 Key Market Indicator (74.9%) and Q1 2018 Key Market Indicator (70.9%). The Australian Capital Territory (ACT) and Victoria (VIC) are next in line for most improved number of first home buyer loans, at 80.6% and 35.3% respectively. NSW, ACT, and VIC are not originally known for their friendliness towards first home buyers, yet states that are – Queensland, South Australia, and Tasmania – their number of first home buyer loans only grew by single digits of 5.0%, 7.5%, and 6.9% respectively. Q3 2018 Key Market Indicators brings us the most positive news regarding the Australian Consumer Sentiment to date, with the index sitting at 106.1 points. This is well above the 100.0 indicator for positive sentiment. This is the highest index reading since December 2013 (105.0 index points), which interestingly was just prior to the Sydney and Melbourne market skyrocketing. Not only that, a 106.1 index reading represents a 9.8% improvement over the past 12 months to July 2017, the highest level of growth over the past 24 months. This is momentous in the Australian market, particularly as we are seeing capital city house median prices – particularly Sydney and Melbourne – slowing down. This truly marks a return to a more sustainable level of property price growth in Australia, and a more confident consumer (towards economic health) because of it.